The NuVasive Spine Foundation is excited to announce the completion of their first mission trip to Harare, Zimbabwe, the nation’s capital and largest city. The mission team initiated a new sustainable spine program in Zimbabwe by partnering with Dr. J. Nozipo Maraire, a board-certified neurological surgeon and expert in spinal disorders. Dr. Maraire received training in the United States and recently relocated with her family to Zimbabwe, where she now practices medicine. On this mission trip, Dr. Maraire performed MAS® TLIF, a minimally disruptive approach to traditional back surgery, on two patients. The procedures were performed at St. Anne’s Hospital and Parirenyatwa General Hospital, the largest medical center in Zimbabwe. The MAS TLIF procedure may reduce blood loss, lessen postoperative pain, and help the patient return to normal activity much faster than patients who undergo traditional “open” spine procedures. The first patient, Mwazha Penelope, age 54, suffered from debilitating back pain and was diagnosed with degenerative disc disease (DDD). The second patient, Plinio Battegelli, age 64, suffered in pain for many years and was also diagnosed with DDD. On May 13th, both patients received life-changing surgery. 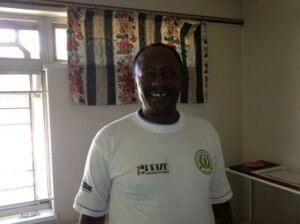 Mwazha and Plinio are getting back to living active and pain-free lives. Your continued support allows the Foundation to expand in disadvantaged countries and provide high-quality medical care to patients in need. 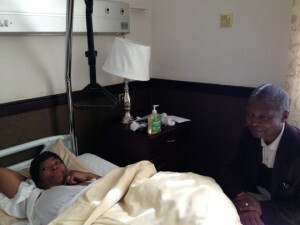 Mwazha Penelope, age 54, recovers with the support of her husband. She is now back to living a life without pain. On May 13, 2013, Plinio Battegelli, age 64, received life-changing surgery and is back to living an active, pain- free life.